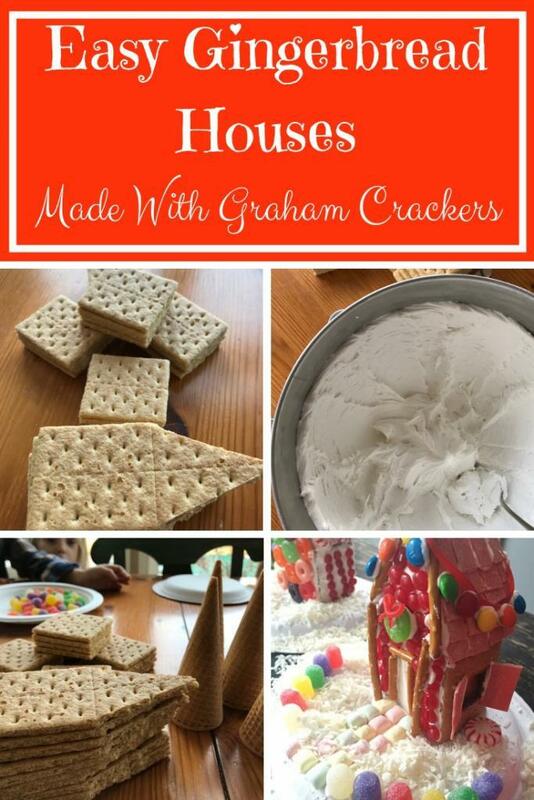 Years ago I was flipping through the pages of a Martha Stewart holiday magazine…And while most of her glorious ideas looked way out of my DIY league, one idea jumped right out at me: easy gingerbread houses made with graham crackers! 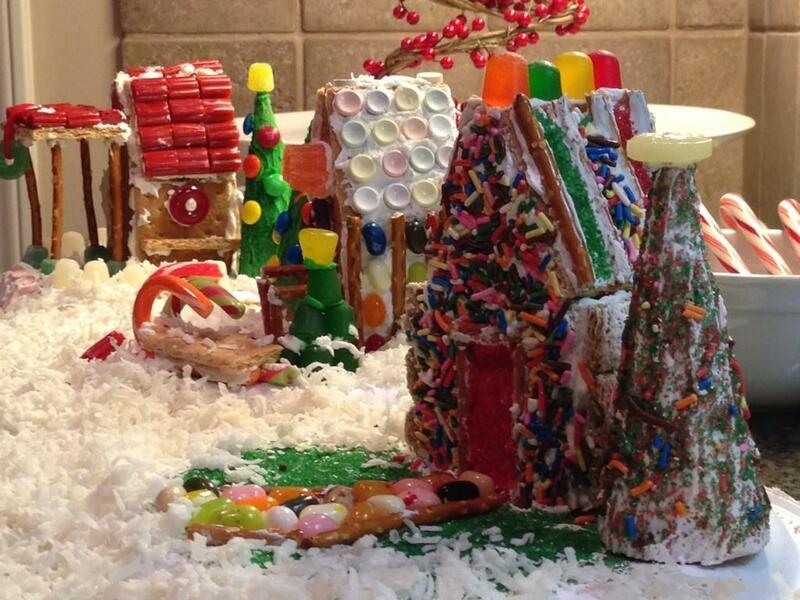 Now this looked do-able–even for a non-crafty mom like me! 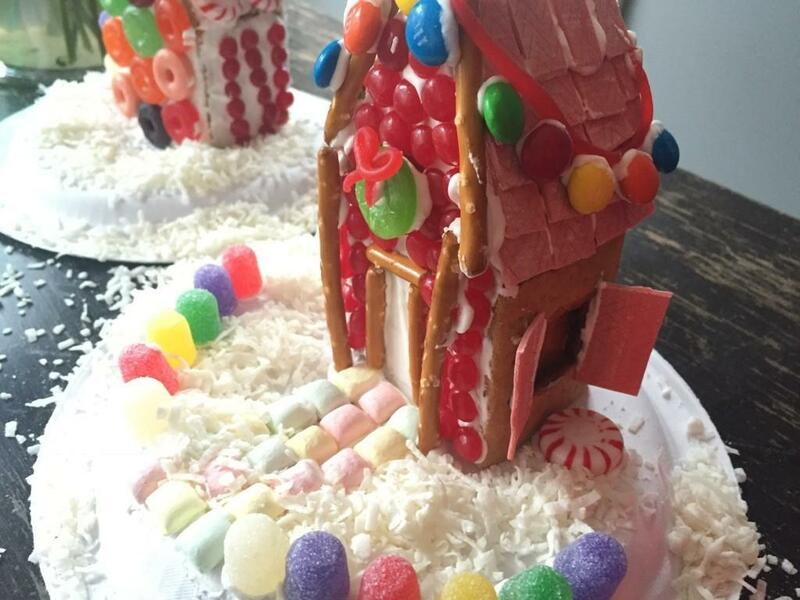 Turns out this simple project has become a central holiday tradition in our home! Here’s how we do it–and a few tips we’ve learned along the way! My husband and I divide and conquer the prep work. He tackles cutting all the graham crackers while I make the frosting and set out all the candy. Each house will need 4 crackers. With a serrated knife, gently saw one cracker in half. Repeat with another cracker. These 4 pieces will be the sides and roof of a gingerbread house. Take another 2 crackers and carefully saw the top corners off to create peaks. 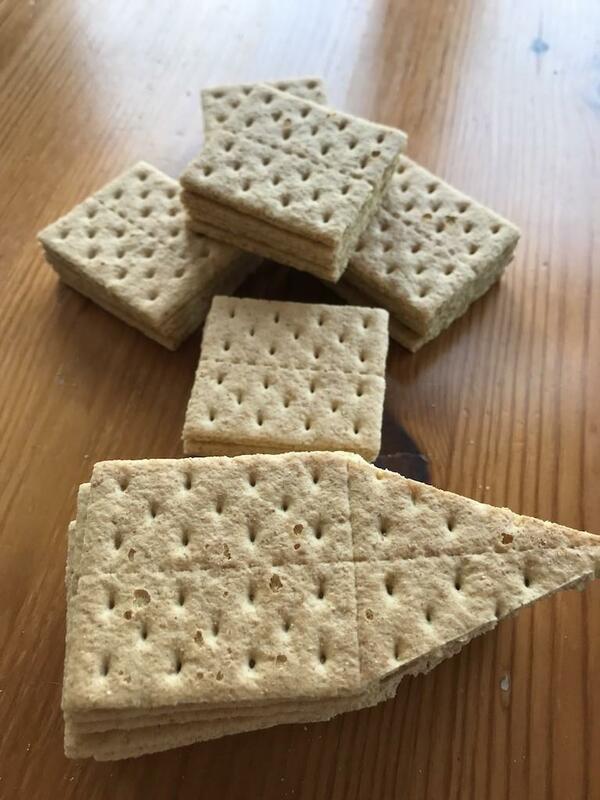 The graham crackers are delicate–try not to be discouraged if a few break! Beat all ingredients at high speed for 7-10 minutes. 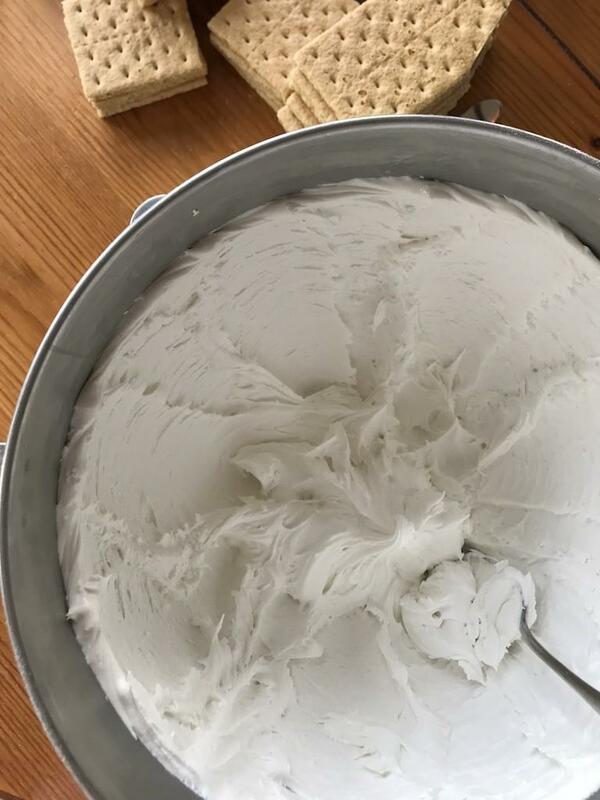 *Tip: Cover the bowl with a wet paper towel to prevent frosting from drying out during the project! Everyone is given an upside-down paper plate to build their house on. 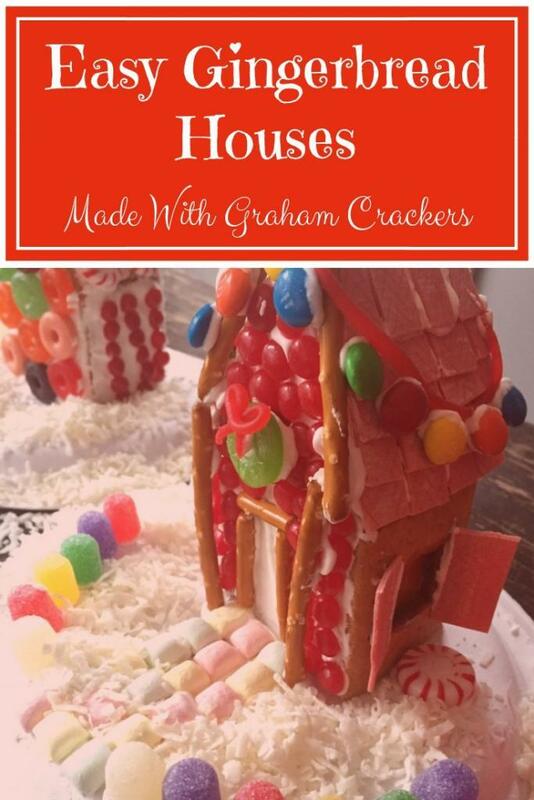 You will definitely want to assemble the houses for younger kids before they get started! Some people like to use bags to pipe on the frosting–but we keep things super simple and just use knives to spread the royal icing onto the sides of our crackers. Start by taking one of the peaked pieces and add frosting to its straight sides. Add frosting to the edge of a square piece, and adhere it to the peaked cracker. Continue adding frosting to the remaining cracker edges until fully assembled. *Tip: Roofs can get heavy with all the goodies! 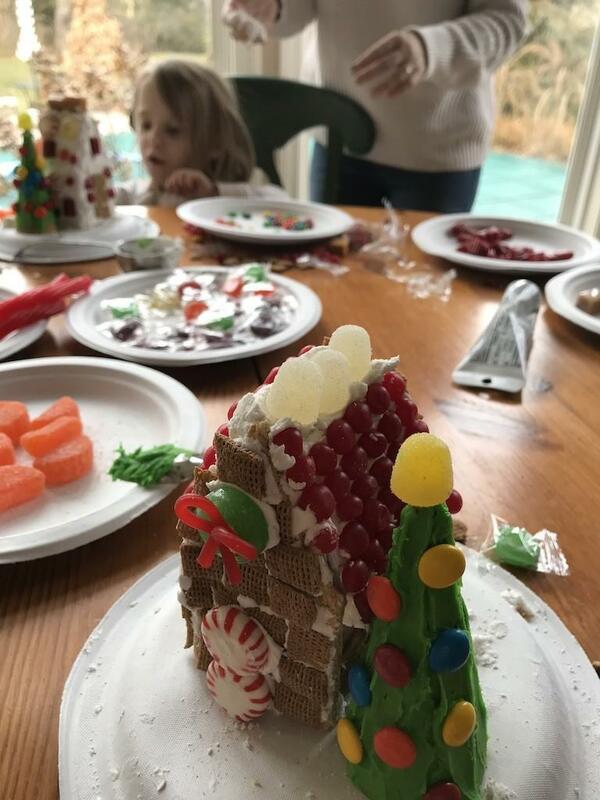 You may want to decorate the roof pieces separately, let them dry and then add frosting to connect them to your house! 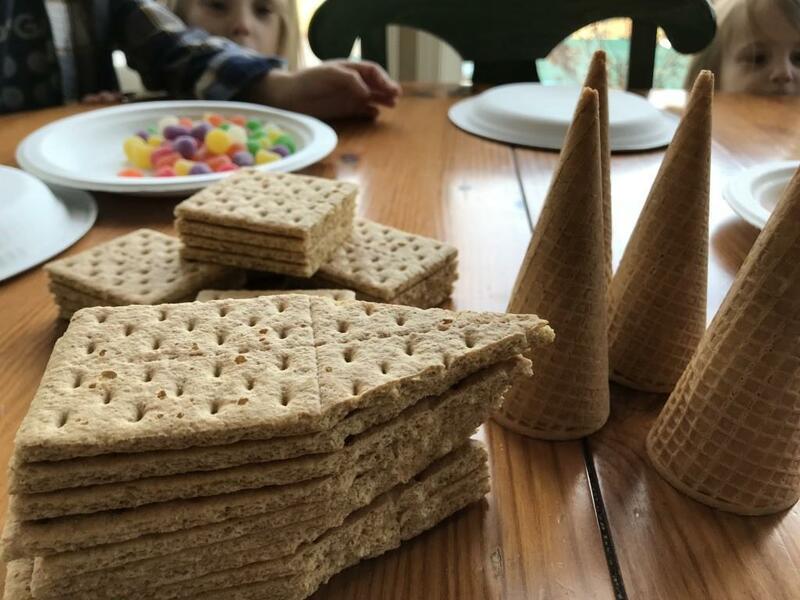 After a gingerbread house is complete, we add other decorations to the paper plates–candy paths, ice cream cone trees (cover them with green icing from the store), and shredded coconut snow! Finding a safe place to display these festive treats is a little tricky with our sneaky dog! We’ve used our sofa table, counter tops, buffet table, and kitchen table as venues to showcase these sweet creations! Wishing you a beautiful and blessed holiday season! Jen Merckling is a former elementary teacher and has been homeschooling her 6 kids for 15 years–she’s got 3 teens, a first grader, and 4-year old miracle twins. Jen has a passion for helping moms find joy and grace in their homeschool and parenting journey! In the middle of dishes, diapers, and laundry–you can find her blogging about the homeschool life at jenmerckling.com. Follow her on Pinterest, Instagram, Facebook, and Twitter!